For the first time, a play by a Mi'kmaw playwright will be performed around a crackling campfire at a long-running theatre company in Nova Scotia. For the first time, a story by a Mi'kmaw playwright will come to life around the campfire at a long-running theatre company in Kings County, N.S. Two Planks and a Passion Theatre Company near Canning has been staging fireside productions for years, but they've never before commissioned an Indigenous artist from Nova Scotia. "We're learning about, first of all, that we do need to talk about these things and that we can survive a conversation, even the most difficult conversations," said playwright and ecologist Shalan Joudry, who lives and works in Bear River First Nation. In the process of staging the play, the theatre company is re-examining its own past, and asking, why it took more than 25 years to commission work by a Mi'kmaw artist. "It's our failure," said artistic director Ken Schwartz. "That's what it is, and in all of these kinds of issues, the reason it took so long is because we didn't do what we should." Elapultiek is a series of conversations between Nat and Bill as they count endangered chimney swifts. It's a topic inspired by Joudry's real-life work with species at risk. The dialogue is drawn from real life, too. At one point when the topic of what to do with statues comes up, Bill says, "I try to stay out of politics." Nat replies, "Lucky you. To be born Indigenous is to be born into politics and these conversations, whether we want to carry them or not." Joudry wants the audience to acknowledge Nova Scotia's colonial history so that they can begin to talk about where the province, and the country, goes from here. "The play isn't just saying, 'OK, this is the one way to see something.' It's that we do really need to have these conversations respectfully," Joudry said. Elapultiek translates into English as "we're looking toward." "My first reaction in reading an early draft of the play was this is an excellent microcosm of what the country faces in some respects, which is just beginning to learn how to listen," said Schwartz. The company has long been interested in stories about the land, being located at Ross Creek Centre for the Arts on North Mountain. It's where artists live, eat and work together as they perform for an average of 2,000 audience members every summer. Once the play's run at Ross Creek ends, it will go on the road to four Indigenous communities across the province. Schwartz said collaborating with Joudry has him re-examining his own ideas about what reconciliation really means. "I think part of the message of this play, and part of what we all have to learn to do is listen more powerfully," he said. Matthew Lumley, a Halifax actor who plays Bill in the play, said it's the first time he's been part of a production about reconciliation. "It's like a constant reckoning with what are the things that I've had the luxury of not paying attention to and ignored?" said Lumley. "And how have I trespassed unconsciously through other peoples lives? ... I'm trying to be accountable and live in the here and now, and that's what my character is trying to do too." Joudry has been dreaming up stories for as long as she can remember. 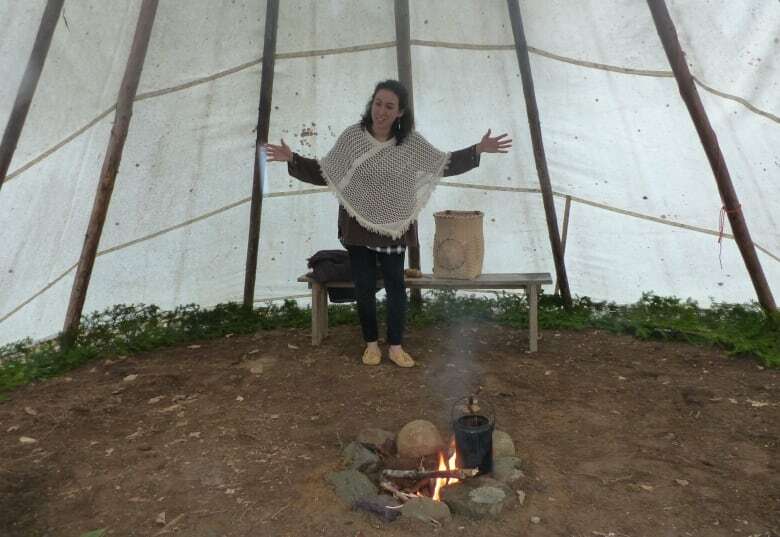 When she started connecting with her Mi'kmaq culture as a teenager, she was drawn to the legends and stories the elders would tell. "There was no other choice but to become a storyteller and a writer, like this was just in the fabric of my being that just needed to come out," she said. These days, when she's not writing and rehearsing the play or working as an ecologist, she brings oral stories — new and old — to Nova Scotians. Jourdry hopes people leave the play with even more questions about Mi'kmaq culture and history, and most importantly, feel inspired to talk about it. "So we'll be able to take the conversation of the future even further, deeper, more together," she said.